Wherein your humble scribe, drawing on the “All The Dice” random generator concept (tip of the hat to Grim), presents a random table for your nerdly needs. My latest obsession/idea is an old school urban crime mini-campaign, something along the lines of the old Gamelords Thieves’ Guild RPG. My first thought was to use Labyrinth Lord/AEC and break down the thieving skills a bit to turn that subsystem into something that players could customize to reflect their own individual thief’s specialties (sort like AD&D 2e did – but I don’t have those books handy to steal from reference). But when I started doing the math I quickly realized I’d be better off using a different system (one that was already skill-based). So in rode BRP and the fabulous Classic Fantasy monograph (to be used if I feel the need to retain a degree of D&D style). If I ever make this get off the ground (and given my current levels of gamer ADD and the general scheduling issues with the folks I play with, that’s a dubious proposition) I’m going to need an idea generator for some thiefly adventures & heists. Hence, the tables below. Please feel free to make use of these in any way you see fit. Sharing makes the world go ’round! Grab yourself a d4, d6, d8, d10, d12, and d20 and roll ’em. Check against the charts below and let your creativity fill things out as needed. Your older brother offers to pay you a lot of money to break into the town armory and steal the enchanted Shield of the Sentinels. Of course, the armory is guarded by a pair of basilisks, but that’s not a problem for someone like you. You know he can afford what he’s offering; you just don’t know what he’s up to, which is planning on double-crossing you by turning you and the shield in for the reward to pay off his gambling debts. Old Garril the Stonemason offers you a number of small diamonds he once found in a wall he was repairing to steal the sixteen large sapphires Korath the Bold recently donated to the Temple of Naali. These are locked in a chest stored within the high priest’s chambers. You’ve heard a rumor that there’s a woman in Amberton who will pay a nice sum of money for a set of enchanted combs that are currently available in the shop of Forlburt the silversmith. The smith is a paranoid sort, who employs a small number of human guards and trained hounds to stand watch over his shop even as he locks all of his merchandise within a heavy (and trapped!) safe every evening. Your guild or crime family needs you to break into the manor house of the Harbormaster and steal the ledgers for the last season’s shipping taxes. Your reward for pulling off this heist is the name and location of the man who killed your family when you were young. Everyone knows that the house is protected by magical wards. Not even your contact knows about the wraith that has been bound to guard the grounds. 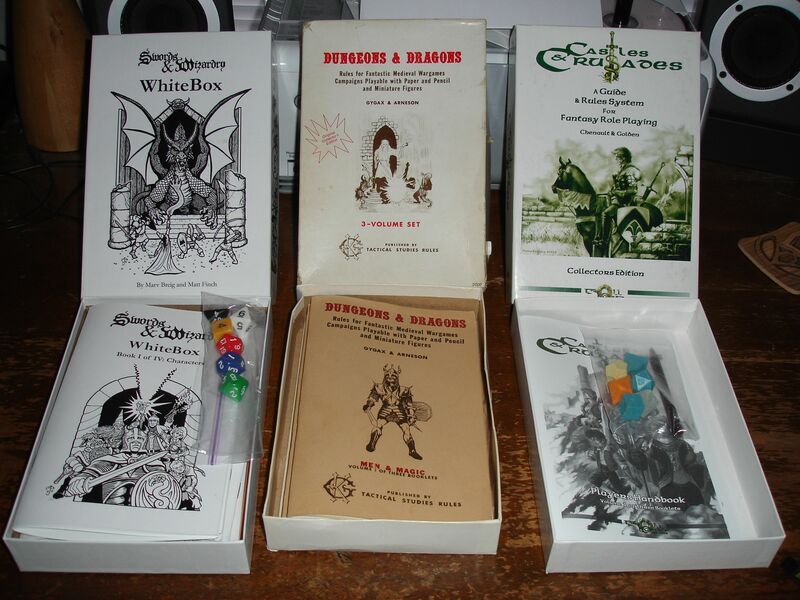 This entry was posted in Barbarians of Lemuria, Basic RolePlaying, D&D, Dungeon Crawl Classics, Labyrinth Lord, Magic World, Mini Six, Open D6, Random Tables, Swords & Wizardry, TFT, Tunnels & Trolls, WhiteBox on April 22, 2013 by the venomous pao. Wherein your humble scribe presents a batch of characters for Swords & Wizardry Whitebox in honor of Swords & Wizardry Appreciation Day. You should have no trouble using these for any of the other flavors of S&W, though. The party failed to run when they should have. Somebody just walked up and asked to join your public game. You need an NPC to befriend (or bedevil) your party. Whatever the reason, you need a character and your need it now. Well have no fear, amigos. Strange Stones has made its name producing pre-made “rogues gallery” style characters for ye olde school and, just for you, here’s a passel you can pick from for your S&W game. Be sure to take a gander at the monsters I’ve put together for S&W as well. Although they’re not officially part of S&W Appreciation Day, you might just find something useful. These are ones I didn’t submit for the S&W Monster Book (now known as Monstrosities, apparently) back in the day. This entry was posted in NPCs, Rogues Gallery, Swords & Wizardry, The Winter Marches, WhiteBox on April 17, 2013 by the venomous pao. We’ve been over this before, but it never hurts to say it. I love Barbarians of Lemuria. It’s a great little system that inspires me and I find it painless to write stuff for it. Of course, great as it is it has a limited player base, especially when compared to a certain well-known 800 lb. gorilla of the RPG scene. So here are some notes I’ve knocked together for converting BoL characters to Labyrinth Lord and other games in that big ol’ extended family. Use or ignore as you see fit. First up, the ever important Attributes. Just like in my Quick & Dirty BoL to BRP Conversion post, attribute values can be derived by taking the BoL value, doubling it and then adding 10 to it. So a BoL merchant with a Strength of 1 would have STR 12 in LL while a mighty thewed-barbarian with a Strength of 4 in BoL would rock an 18 STR in LL. And so on. Hooray for that 3-18 scale that’s so popular with a certain era of games! As with the BoL-to-BRP conversion, one could surely devise more detailed and “realistic” formulas for this sort of thing. But for most purposes, the above should work. That said, if you really need a character to be high INT/low WIS (or low STR/high CON, etc. ), just adjust as needed. Probably the biggest issue in this conversion is dealing with taking a non-class/non-level system like BoL and rendering class- and level-based characters out of it. There are probably a million different takes on this, but my suggestion is just to make the LL character’s level equal to the sum of the BoL characters career ranks. So your typical starting BoL character would come over to LL as a 4th level character, while the average BoL NPC (per the examples in the Legendary Edition) would wind up as a 2nd level character. This power level in LL might not quite match up with BoL, but it seems to give the characters a reasonable leg up while leaving room to grow as well. And hey, the original title for a 4th level Fighter was Hero and a 4th level Magic-User is called a Magician in those lovely light blue rules designed for experts*, so I’m happy with this. Since classes are normally generalized while careers can be a bit more specific, I also suggest looking at the character’s career ranks and giving them +2 per rank in a career on Ability Checks related to the careers (but not to combat or thieving abilities or anything else that specifically mechanical in LL – those things come with level, not career rank). So that BoL character with 2 ranks in Merchant would get +4 on attribute checks relating to the buying & selling of goods, knowledge of caravan routes, and so on. Oh, and while having a Zero in a career rank won’t get you a bonus to checks, just like in BoL it could very well make checks possible that a normal person wouldn’t be able to make (por exemplo, the classic Thief 0 allowing you to know about the local thieves’ guild in ways that someone with no rank at all wouldn’t). BoL’s Boons & Flaws also don’t translate directly to LL. But, just like with Careers I suggest granting PCs and important NPCs a bonus (+2 or so, but maybe higher or lower depending on your needs) on Ability Checks (or Saving Throws) that relate to a boon that the BoL version of the character possessed. Similarly, imposing a penalty of −2 (or so) on rolls relating to a Flaw found in the BoL iteration of the character should get the job done just fine. In the case of Boons & Flaws that don’t modify dice rolls, a little improvisation will be necessary. But the author of this quick & dirty guide trusts that his readers can handle those situations on their own and in the ways that will best suit their own needs. The examples given above are, as indicated, rough equivalents. I can do the math and know that Chain & a shield actually equals AC 4 and not AC 2. Remember, though, that BoL is much more fluid in its definitions of what armor levels equate to. If you want to be more precise, then by all means be more precise. Oy, here’s a challenge. BoL’s magic system so completely doesn’t mesh with the Vancian fire-and-forget stuff that Labyrinth Lord and its relatives use. I suppose you could just say “Well, you’re a 4th level magic-user, so act like one” and be done with it if you want to keep it simple. I also suggest having BoL characters with Priest career ranks but no Magician ranks not be treated as Clerics, since BoL Priests don’t really work “magic” in the spellcasting sense. Ignore that suggestion if being a Cleric is really key to the conception of the character as it is crossing the line between these two world. One other idea that occurred to me is that the Vancian stuff could work as a reasonable model of BoL’s Alchemy. Instead of having X number of spells per day per level, though, you’d get X number of alchemical preparations (which you define with Labyrinth Lord spells) per adventure. Just use the M/U spell tables to determine what X is and you’re set. So I’d class BoL characters who were Alchemists as M/Us in LL-land but restrict their usage of spells as noted above. To offset that, I figure you’d need to give them better HD or something. But again, that’s beyond the scope of this post. But what about Movement? As I see it LL Movement varies quite a bit independent of creature size, while in BoL’s “Base Move” is entirely based on creature size. I’m too lazy to come up with a specific approach here, so I’d suggest just defaulting everything to LL’s 90/30 unless being fast or slow is part of the creature’s schtick. In that case, adjust accordingly. For monsters’ attributes, just use the same translation method as for PCs ([BoL Att*2]+10) if you need to know them. But since LL doesn’t often reference creatures’ attributes, this shouldn’t matter too often. Note that even though he had a rank of 0 in Sorcerer as a BoL character I went ahead and made him into a 100% Magic-User in LL. Even rank zero qualifies you to cast some scary stuff in BoL, so having that should – at a minimum – result in a 2/2 split with another class. More often, though, it should override all the other possible class considerations (in my opinion). Or you can, of course, build the character without magic at all. That’s an entirely reasonable approach as well. Mostly I think it depends on your conception of the character in question and the level of magic in the campaign you’re working with. Now, let’s convert a monster – just for fun. In this case, let’s use the Ilthoth-eg of Nogoloth. Small, grey-furred cat-like beasts that inhabit the caves deep within the northern mountains of Nogoloth, Ilthoth-eg are set apart from the “normal” wildcats of the region by their abundance of eyes. A typical Ilthoth-eg possesses somewhere between 7 and 11 eyes arrayed across their bodies. Though not truly intelligent, these animals chitter and whisper their previous victims’ words as they stalk their prey through the darkness of the caves. Due to their abundance of eyes, Ilthoth-eg are only surprised on a 1-in-6. Further, these creatures are incredibly difficult for thieves to backstab. A thief attempting to perform this maneuver against an Ilthoth-eg suffers a −25% penalty to the move silently and hide in shadows rolls necessary for a successful backstab. Following my suggestion of tweaking the movement rate for a converted creature beyond 90/30, I upped these guys slightly based on their wildcat-esque nature. I improvised on the No. Encountered, Morale and Hoard Class for these guys. The Save As and XP Value were calculated per the LL rules. So that’s my ideas for converting Barbarians of Lemuria characters and monsters to Labyrinth Lord. I think they’ll get the job done well enough for most purposes. These should also allow you to take BoL resources and use them in any other game from the same gene pool as LL. Those games are, after all, pretty much the same game with some minor changes here and there. I’m open to any thoughts you, my readers and friends, might have on how to handle things. So go nuts in the comments if you like. Your input is, as always, invaluable to me. *Other iterations of the source material refer to a 4th level MU as a Theurgist. You can’t win ’em all. This entry was posted in Barbarians of Lemuria, Barbarians of the Aftermath, D&D, Labyrinth Lord, OSRIC, Swords & Wizardry, WhiteBox on March 21, 2011 by the venomous pao. Check it out. There’s a mini-convention on Saturday July 31st (and again on August 21) here in Austin. And it’s dedicated to playing old school D&D, no less. Interestingly, it’s put on in part by (or at least in conjunction with) the folks who do the ever-growing North Texas RPG Con. And guess what? Your humble scribe is going to be in attendance (for the July 31st event, at least). See, my wife’s out of town that day and Scholz Garten is maybe a mile from my house and the con itself is free. So really, how could I not go? Now, for the record, I’m very much not a con guy. The last gaming convention I went to was AggieCon ’95, and that was almost entirely a business trip. I definitely didn’t game at that one. The last time I went to a con where I actually played or ran something you have to go all the way back to 1985, for the twin majesties of TexCon (where I won an Illuminati event of some sort) and DalCon (where I ran a fun Champions game and played my only session of Runequest). I’m pretty sure my only other gaming con experience was Origins ’84 (where I picked up my well-loved OCE box) and didn’t actually play anything. I tend to go to panel discussions and such with these things rather than game, it seems. This entry was posted in D&D, General Geekness, Labyrinth Lord, OSRIC, Swords & Wizardry on July 24, 2010 by the venomous pao. Wherein your humble scribe presents a new monster for Swords & Wizardry (Core Rules), the Pyroceros. A Pyroceros looks much like a normal rhinoceros, except that its horn is composed of a powerful, ever-burning magical blue flame. Strikes by this horn have a 50% chance of igniting any flammable material worn by the unlucky victim. Characters wearing or holding an ignited item will suffer an additional 1d6 damage from the burning for 1d4 rounds or until they rid themselves of the burning material. Pyroceros: HD 9; AC 4 ; Atk 1 flame horn (3d6) or 2 trample (2d4/2d4); Move 12; Save 6; CL/XP 11/1700; Special: only take half damage from fire-based attacks, burning damage continues after successful horn attack. This entry was posted in Monsters, S&W Bestiary, Swords & Wizardry on June 15, 2010 by the venomous pao. 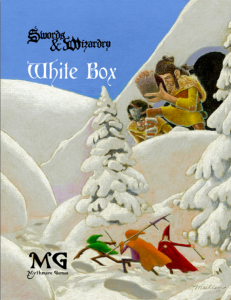 Wherein your humble scribe presents a by-the-book adventuring party for Swords & Wizardry (WhiteBox). Pretty much just for the hell of it. This, my friends, was difficult for me. Rolling up a straight, by-the-book, Swords & Wizardry (WhiteBox) party when you come from a heavily AD&D background is hard on the brain. The power level is so, so low. I can understand why some folks prefer this, but as much as I love my WhiteBox box (and my OCE box before it) I don’t think I could actually play this way. I’ve just got too much of the supplements (and later versions of the rules) in my blood. Still, it was edifying and under the right circumstances I’d happily give this kind of game a try as a player. I’d try it as a GM, too, but I’d never in a million years get my normal player group to go along with it. They’re too enamored of the power levels associated with later iterations of old school play. For the record, what I think I miss the most is the broader range of attribute modifiers. And the beauty of S&W is that I could easily add those in if I wanted to. Still, if I’m going to do that, and then start adding in spells (hey there, Magic MIssile) and other things that I’m also missing I’m reaching a point where I might as well be playing a different game. One that has what I’m looking for already in it (LL/AEC comes to mind). In any case, though it may not be what I’m likely to play, I’m damn glad S&W exists. So please don’t take my personal observations as anything negative about the game itself. I’m just realizing how it relates to what I’m looking for. And, of course, I do like designing for S&W (Core more than WB, though) – in no small part because it is so very small and free in scope. This entry was posted in NPCs, Swords & Wizardry, WhiteBox on June 13, 2010 by the venomous pao. Wherein your humble scribe presents a new monster for Swords & Wizardry (Core Rules), the Kuk Bhan Naong. Found near rivers and coasts in tropical climates, Kuk Bhan Naong are incredibly large amphibious snails with brightly-colored shells that are as hard as steel. These bizarre creatures attack by launching a single harpoon-like tooth from their mouths, delivering a paralyzing poison to their victims (save at -2). The paralysis caused by Kuk Bhan Naong poison lasts for 3d6 turns and they may launch this attack to a distance of 30′. Kuk Bhan Naong: HD 9; AC -1 ; Atk 1 sting or 1 bite (1d6 + paralysis or 1d8); Move 6; Save 6; CL/XP 12/2000; Special: paralyzing poison, half-damage from piercing weapons. This entry was posted in Monsters, S&W Bestiary, Swords & Wizardry on June 9, 2010 by the venomous pao. Wherein your humble scribe presents a new monster for Swords & Wizardry (Core Rules), the Cairn Witch. A Cairn Witch is a fearsome, evil hag-like being that haunts the areas around burial mounds and sites of ancient battles. These creatures possess powerful spell-casting abilities, which they use to great effect. Treat cairn witches as 7th level magic-users. A cairn witch will normally do its best to use its arcane powers to sow discord among an adventuring party, endeavoring to drive the group apart so that its individual members are easier targets for her wrath. Though they are not undead, cairn witches may be turned as though they were 12 hit die creatures. Cairn Witch: HD 7; AC 4 ; Atk 1 weapon or 2 claws (1d4 or 1d3/1d3); Move 9; Save 9; CL/XP 11/1700; Special: spells, 40% magic resistance, half damage from non-magic weapons. This entry was posted in Monsters, S&W Bestiary, Swords & Wizardry on April 28, 2010 by the venomous pao. Wherein your humble scribe presents another new monster for Swords & Wizardry (Core Rules), the Dung Spider. Dung Spiders are poisonous arachnids roughly the size of two large fists held together. They take their name from the unique way in which they lie in wait for prey. A dung spider curls its long legs in on itself and sits on the ground, appearing to be a small pile of animal feces, biding its time until some unfortunate creature passes close enough for it to strike. When a target comes within 10′ of the dung spider, it uncoils rapidly and launches itself at its victim. The first time a creature encounters a dung spider surprise is automatic. Any future encounters will also result in automatic surprise unless the victim is particularly wary of being attacked by a dung spider. Dung Spider: HD 1; AC 6 ; Atk 1 bite (1d2 + poison); Move 12; Save 16; CL/XP 3/60; Special: lethal poison (+3 saving throw), automatic surprise. This entry was posted in Monsters, S&W Bestiary, Swords & Wizardry on April 22, 2010 by the venomous pao. Wherein your humble scribe presents a new monster for Swords & Wizardry (Core Rules), the Coineater. Don’t read too much into the timing of this particular post. Coineaters are man-sized humanoids with remora-like heads. They actively seek out individuals in possession of any quantity of coins greater than a handful and will follow them about while emitting an annoying high-pitched whine. This sound increases the chance of a wandering monster encounter to 3-in-6 per turn. If the target of the coineater’s pursuit leaves a pile of his coins equal to approximately 1/3 of the gp value possessed in a small neat stack the coineater will devote its attention to devouring the previous metals and cease following the target. A coineater so appeased will not follow the same individual for a full year. If attacked, or if not provided with appropriate tribute within 2d4 turns, a coineater will respond by latching onto the target with its vicious, rasping mouth and will begin sucking the unfortunate victim’s blood. A coineater will cease this blood drain immediately if the appropriate tribute is offered. Otherwise, it will continue to drink until the victim is dead. After the death of its victim the coineater will devour 50% of the target’s coins and then head off in pursuit of a new source of nourishment. Coineater: HD 10; AC -1 ; Atk 1 bite (1d4); Move 15; Save 6; CL/XP 12/2000; Special: blood drain (1d6). This entry was posted in Monsters, S&W Bestiary, Swords & Wizardry on April 15, 2010 by the venomous pao.